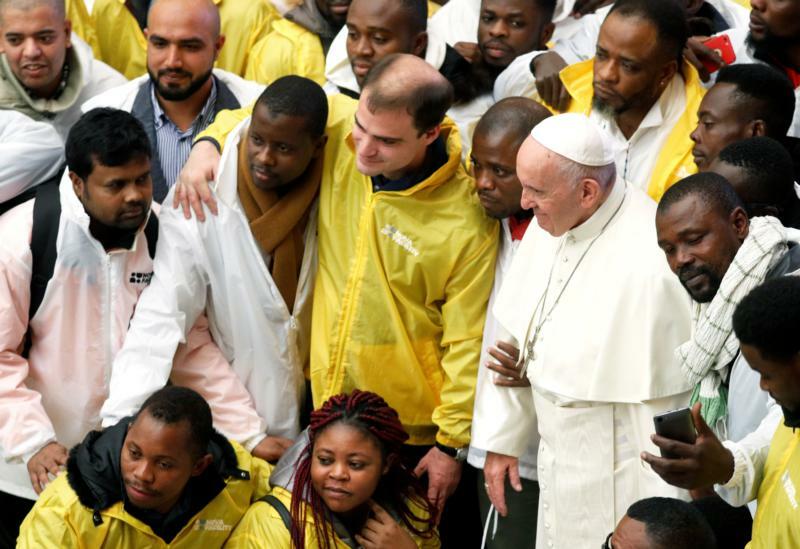 VATICAN CITY (CNS) — Every heart enslaved by false idols and evil desires needs a “transplant” with a heart filled with love, joy, goodness, hope and generosity, Pope Francis said. “How does this ‘heart transplant’ happen? From an old heart to a new heart? Through the gift of new desires,” the pope said Nov. 28 during his weekly general audience in the Vatican’s Paul VI hall. The new desires are seeds planted by the Holy Spirit, growing into a thirst for a new life, like Christ’s, that is hopeful, grateful, free, blessed, generous and sincere, he said. The pope’s catechesis before the start of Advent Dec. 2, was the last of his series of talks on the Ten Commandments. The commandments, he said, should not be seen as a series of rules, but rather as a process of “benediction and liberation” that leads to a true, authentic life, finding “rest” and salvation in God. God, he said, “asks for nothing before he has given so much more” first. “He invites us to be obedient in order to free us from the deception of idolatries that have so much power over us. In fact, seeking self-fulfillment in the idols of this world empties us and enslaves us while what gives us stature and substance” is a relationship with God, the pope said. God calls people to “the beauty of fidelity, generosity and authenticity,” he said, but how does one get there? “We need a new heart, in which the Holy Spirit dwells,” the pope said. This new heart grows from new desires that are “sown in us by God’s grace, particularly through the Ten Commandments,” which Jesus brought to fulfillment. “The Lord Jesus did not come to abolish the law, but to fulfill it, to make it grow” from being a list of rules and prohibitions to becoming new life, the flesh of Christ himself, “who loves us, seeks us, forgives us, consoles us,” leading people back to God the Father after losing their way through sin and disobedience, he said. Through Christ, the “negative” don’ts and shall nots of the commandments are transformed into positive attitudes and actions, such as love and making room for others in one’s heart, Pope Francis said. The commandments, he said, are like “an X-ray” of Christ or like the Holy Shroud of Turin, where his face is revealed in the negative. Gazing at Christ “we see beauty, the good, the truth,” and reflecting on a life guided by the commandments, one discovers it is an image of the life of Christ, a life that is “grateful, free, authentic,” blessed, mature, caring, loving of life, faithful, generous and sincere, he said. By opening one’s heart to God, the Holy Spirit will come and generate new life there, planting seeds of hope, faith and love, helping people conform their hearts ever closer to Christ’s. “Those no’s switch to yeses, positive actions of a heart open to the power of the Holy Spirit,” the pope said. After the pope’s main talk, a small child wearing a bright blue sweater sauntered from the seated section of the hall up the marble steps toward a Swiss guard standing near the pope. Curious about the perfectly immobile guard, the boy took the soldier’s gloved hand and pulled on it gently, then lost interest and wandered behind the pope’s chair. The pope let the boy continue wandering about on stage even though his guards and aides tried coaxing him away. When the pope greeted Spanish-speaking visitors in the hall he said, “This boy cannot talk. He is mute, but he knows how to communicate and express himself” nonetheless. “He has something, which makes me reflect. He is free. Free in an undisciplined way,” he laughed as the audience applauded. “When Jesus says we have to be like children, he is saying we have to have the freedom a child has with his father,” and that is what this child has displayed and “has preached to all of us,” the pope said, asking people also pray for the child to be able to speak someday.